Green Street Pet Basics Dog Nail Clippers with Nail File by Green Street Pet Basics at newmexicoveterinary.org. MPN: 4334797450. Hurry! Limited time offer. Offer valid only while supplies last. Clip your pet's nails with confidence! Thanks to super-sharp blades & built-in safety guard, these clippers will cut ANY dog's nails easily & safely. Clip your pet's nails with confidence! Thanks to super-sharp blades & built-in safety guard, these clippers will cut ANY dog's nails easily & safely. Bonus nail file & instruction eBook included. Scared to clip your dog's nails for fear of cutting too deep? Never fear! With our Green Street Pet Basics Clippers, you can give your precious pooch that perfect "mani-pedi" - without worrying about over-trimming. Bottom line? With these sharp, safe clippers, you'll always trim the nail's white tip - NOT the "quick" - just like the pros do. Your clippers come with a FREE steel file, custom-made for smoothing dogs' nails. There's even a slot for storing the file, right inside the clippers' left handle! As soon as you order, we'll send you a PDF eBook, filled with helpful tips for grooming your dog at home. If you're unhappy for any reason, return your clippers for a money-back refund. 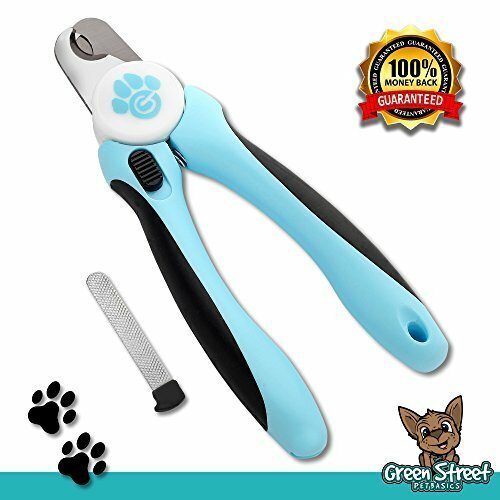 SHARPEST AND MOST DURABLE DOG NAIL CLIPPERS AVAILABLE ★ Strong and sturdy construction designed to cut nails with one swift cut. Don't make your dog or puppies paws or claws bleed -- use precaution by using the Green Street Pets' brand professional dog nail clippers to snip your pups nails cleanly, evenly and without pain to your pet! STAINLESS STEEL BLADES // CAN BE USED ON ANY DOG BREED ★ Highest of quality, extremely sharp, stainless steel blade that can be used on all breeds and any sized dogs - small, medium, and large. Other clippers get jagged quickly and end up hurting your dog or cause bruising and bleeding when your dog or cats nails are cut -- don't let that happen and be sure to use the sharpest and most precise scissors around. ERGONOMIC HANDLE GRIPS FOR EASY CLIPPING EVERY TIME ★ Our comfortable, non-slip handles are designed to ergonomically mold around your hand for extended comfort and ease of use. Don't settle for inferior clippers when you can use a pair that will work just as good as those you see at professional pet groomers. DON'T MAKE YOUR DOG BLEED // QUICK SAFETY STOP PREVENTS THIS FROM HAPPENING ★ Specifically designed with a safety stop guard that will greatly reduce the risk of injuring your dog by nicking and/or overcutting the nails at too short of a length. With safety in mind, you will always have a happier puppy at all times. BONUS NAIL FILE INCLUDED WITH PURCHASE ★ Handy nail file included as a bonus to file off any rough edges on your dog's nailbeds. ★ 100% LIFETIME MONEY BACK GUARANTEE ★ We offer a no-questions-asked 100% Lifetime Money-back guarantee on all of our products! If you have any questions about this product by Green Street Pet Basics, contact us by completing and submitting the form below. If you are looking for a specif part number, please include it with your message.